Over the course of a few days in October 2012, New Jersey was forever changed. 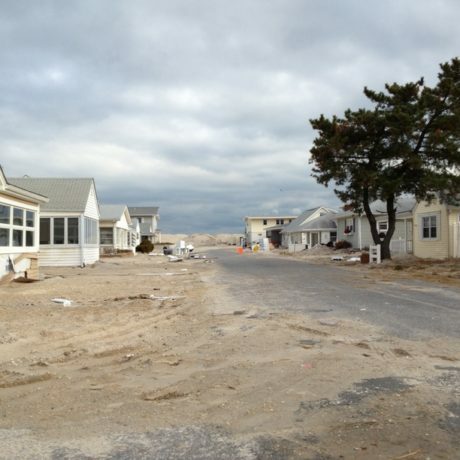 Superstorm Sandy washed communities away and turned once familiar landscapes unrecognizable. Although the tide has receded and the winds calmed, the long-term impact of Superstorm Sandy on New Jersey- particularly, its built environment- is just beginning to come into focus, and remains fraught with uncertainty and unanswered questions. Recovery from the impacts of Sandy has been and will continue to be particularly challenging for historic places- the recovery process is by nature not one that necessarily allows for the time, thoughtful planning, and holistic assessment that appropriate historic preservation requires. Anytime a historic resource is significantly damaged, it is threatened. Although many of the historic buildings that were impacted by Sandy have weathered similar storms in the past and could be repaired, misinformed property owners and decision-makers too often see damaged historic properties simply as expendable old buildings. New regulations that stand to drastically alter both damaged properties and those that were not damaged, but are in an area deemed to be at high risk of flooding add increased cause for concern. New rules governing eligibility for the National Flood Insurance Program allow communities to mandate that new construction in flood zones be elevated above Advisory Base Flood Elevation levels. Existing buildings that meet the “substantial damage requirement,” meaning that they were damaged over 50 percent, will also have to adhere to the elevation requirements for new construction in order to secure the necessary permits to rebuild. There are exceptions and alternatives for historic properties- many municipalities have variances within their municipal floodplain ordinances, and entities such as the Federal Emergency Management Agency (FEMA) offer substantial guidance on wet floodproofing and other flood damage mitigation construction measures. But buildings in designated flood zones that remain below Advisory Base Flood Elevation levels will likely pay a substantially higher premium for Federal flood insurance, and laudable concerns about the long-term sustainability of non-elevated properties in proven flood zones remain. What is the best approach for preserving existing historic integrity when that integrity does not accommodate new environmental realities such as sea level rise? Concerns about preserving the integrity of individual buildings is amplified when these buildings are considered in context, as elements of historic neighborhoods, communities, and regional landscapes. What does the future look like in storm-ravaged communities like Mantoloking, where, of the 512 buildings that comprised the borough before the storm, 135 were destroyed, an estimated 56 are partially underwater in the bay, and around 100 are entirely or partially off their foundation? There are two historic districts defined as eligible for the National Register of Historic Places in that community: the Mantoloking Historic District and the Mantoloking Marine Historic District. But the municipality has not benefited from a comprehensive historic resources survey since the 1980s. With limited available data about Mantoloking’s heritage pre-Sandy, getting an accurate read on the significance and integrity of what was lost is impossible, and factoring what we do know into recovery efforts will prove extremely challenging. Some severely damaged historic communities, such as Beach Haven, benefit from an active and informed municipal Historic Preservation Commission (the most effective protection for historic resources that a community can have). But the commission is now faced with reviewing applications to replace and elevate properties throughout their historic district, and the outcomes of these reviews stand to drastically alter the integrity of that neighborhood. How can preservationists most effectively institute a holistic approach that prioritizes preservation of the historic character that makes these communities special, while respecting that recovery and future planning must accommodate unprecedented development realities? Considered even more broadly, throughout New Jersey, even communities that did not experience significant damage from Hurricane Sandy are grappling with these issues. New federal Advisory Base Flood Elevation maps are being finalized, delineating multiple levels of “at risk” areas wherein new recommendations for elevation will be the most stringent. These maps will change the built environment of the areas that they designate permanently, jeopardizing any historic resources that are in the path. The need to educate property owners about the benefits of repair over replacement, and options for preservation-conscious restoration, are massive. Much of the federal funding that has been approved to offset property repairs will purportedly only be applicable to work that meets the Secretary of the Interior’s Standards for the Treatment of Historic Properties- the National Park Service’s basic guidelines for the appropriate repair, rehabilitation, and restoration of historic resources. This is encouraging news for preservation, as it means that owners have an incentive to repair historic properties appropriately. But these owners need education as to what “appropriately” means, and how to accomplish it, particularly in the midst of so many other recovery priorities. Similarly, municipalities and decision makers need basic training about their community’s historic resources, and the review requirements, such as Section 106 of the National Historic Preservation Act, that are inherent to many federally-funded recovery efforts. 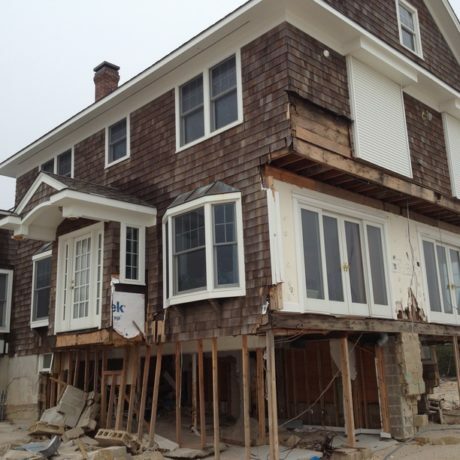 The preservation community is only now beginning to get a clear handle on the tools available for Superstorm Sandy recovery, and the most significant challenges that historic resources in New Jersey are facing in the process. From federal funding that may or may not require preservation-conscious review, to local code officials that may be working with the needs of historic resources for the first time, to an unprecedented need for recovery funding and technical assistance, it will continue to be up to those of us who care about heritage and historic places to help ensure that the preservation of New Jersey’s historic resources is an ongoing priority as recovery planning and implementation move forward.